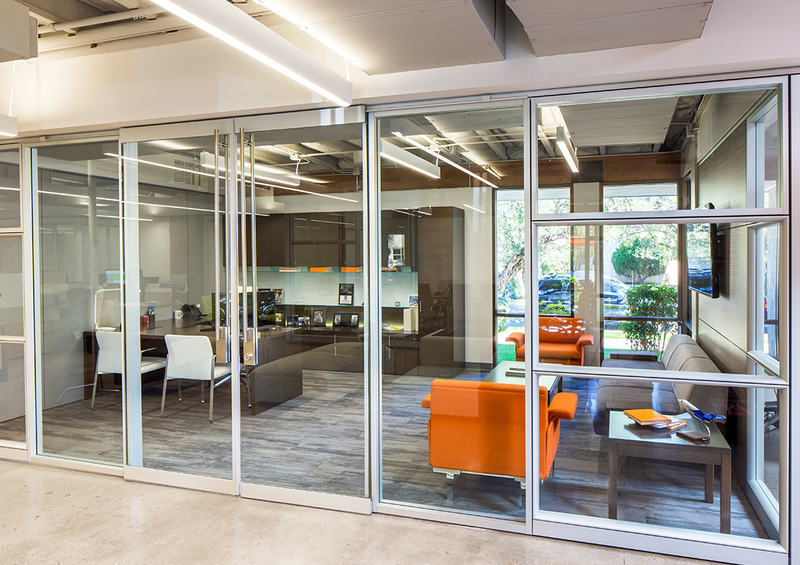 As a commercial furnishings company, Transact found a new office space in Phoenix with the goal of showcasing their various products an creating an inviting open work environment. The overall design creates a multipurpose, flexible environment that highlights Transact’s vendor products, as well as provides various areas for meetings and entertaining clients. 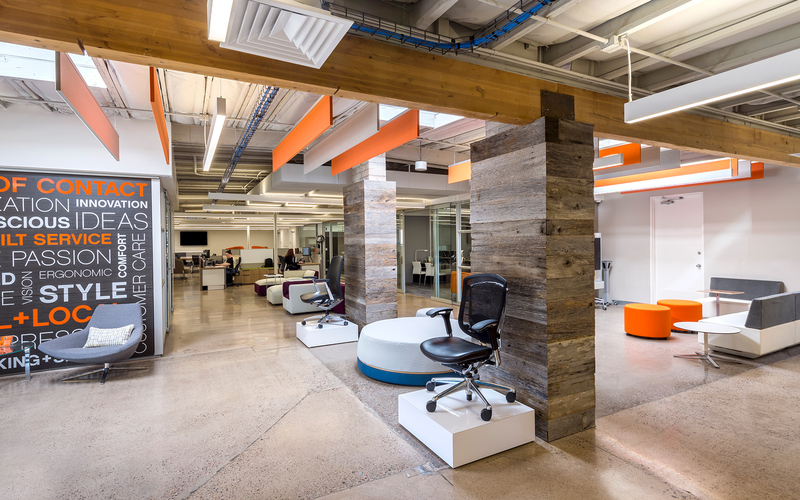 The new space allows Transact clients to park and access the showroom with more ease than the previous office space. Custom metal handrails provide both ADA accessibility and wayfinding to the main entry. 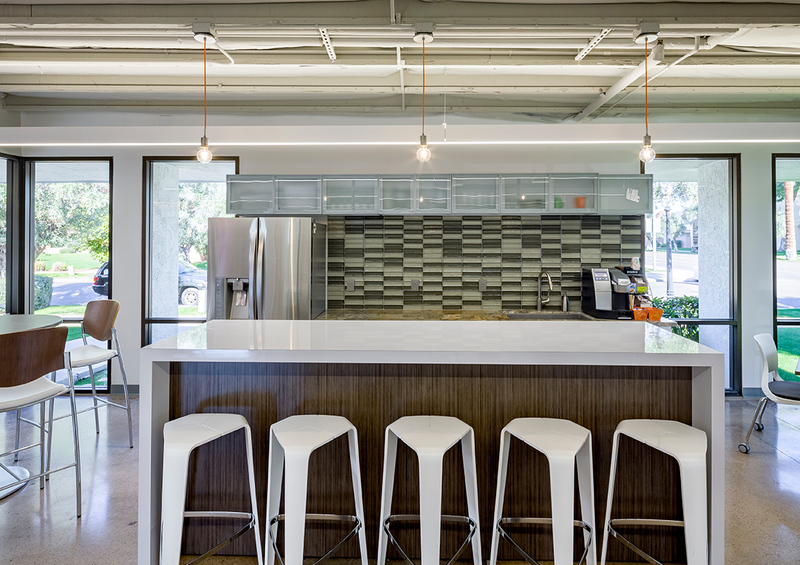 A challenge for the design was achieving an open work environment within a 1970s building with low ceilings. In order to maximize ceiling height, rectilinear ducts were used and the ceiling was painted a light gray. The use of continuous LED light fixtures maximize daylight from the existing windows and skylights all contribute to the welcoming atmosphere. Two interior columns are encased with reclaimed wood materials relating to the exposed wood girders, adding warmth to the space. All de-mountable partitions erected throughout the office are products represented by Transact, giving them the ultimate flexibility to sell and promote their products. Because an open environment was desired, white noise was added throughout, mitigating the sounds of daily activities and increasing associate productivity.